One of the reasons we can offer such excellent value on our stock products is because we are also bag and film manufacturers. This means you cut out any middle-men when you deal with us directly and so you get the same quality goods at rock bottom prices. 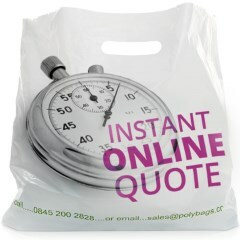 Our manufacturing ability also allows us to make products designed specifically for your needs and you can get a free no-obligation quotation for manufactured bags or film or specifically for printed carrier bags (carrier bags printed with your own logo or design). We have included this guide in case you are new to the manufacturing process and would like to learn more. Of course you don't need to know any of this, as we do it all out for you, but it may help you understand your options better. Standard Melt 2 Low Density Polythene (LDPE) Films for general packaging applications. Suitable for the majority of general film and bag requirements, our standard film blend has an anti-blocking agent and a slip agent to help during the film extrusion process and to produce a product that it easy for you to handle and open. Film without slip or with additional slip concentrations is available on request and our film is certified Food Grade Approved. Low Slip Melt 1 LDPE Films for shrink film and sack applications. This film has a higher molecular strength and is designed for shrink applications. During the extrusion process the film is expanded into a bubble whilst molten and then quickly solidified, effectively sealing in the shrink effect which is released when heated by a shrink gun or heat tunnel. This grade also has no additives which means it has a less slippy feel and is suitable for stacking. Its higher molecular strength than the Standard Melt 2 film also means it is used to manufacture heavy duty sacks. High Melt 4 LDPE Films for thin dust cover/garment cover uses. A soft film which has limited strength properties but is very flexible and so we are able to downgauge during extrusion to very thin films of 80gauge (20micron) or less. 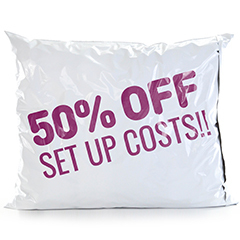 This can save significant quantities of film and so cost to you where the application is very light duty, in particular for garment and dust covers. High Tensile Films for maximum strength to thickness requirements. A blend of polymers including Medium Density Polythene which creates the ultimate strength film at thin thicknesses. Clarity is not as good as other films nor is flexibility (film has a slight rough crinkly feel) but the material is perfect for thin food grade tint sheets and other tinted and coloured films. Metallocene Blends for premium high clarity Films. Metallocene is a term for polyethylene raw material that has been manufactured in a slightly different way to usual using a metallocene catalyst, resulting in film with extremely good optical and strength properties. There is additional cost in manufacturing Metallocene raw material and so the film is more expensive but this may be justified where high film clarity and strength is required. Electroconductive Blends for electrically sensitive packing. Electroconductive film is based on special blends of highly conducting carbon Blacks compounded into low density polythene. The film is therefore electrically conductive and designed for handling and packaging electrostatic sensitive devices. As a result of its spark free properties, it is also used to store explosive devices although it can also be used for general packaging to avoid dust attraction on components. Biodegradeable Film for composting applications. Our biodegradable film has an additive blend which provides first oxidative and then biological degradation of the material, typically within 6 months to 2 years in a landfill site or standard composting system. Compared to many other environmental alternatives, this is a cost-effective, strong and recyclable film solution. Reprocessed Films for low cost and low quality uses. Reprocessed Film is extruded on request. The main problem is lack of recyclable material available as it is such a popular option. Although product quality is not as good as virgin material, recycled film is a low cost and extremely environmentally beneficial film solution and we will always offer it whenever we have sufficient material. Commercially to keep costs low (more output from the same fixed costs). Product Quality as extrusion equipment runs best when operated on a continuous basis. Your lead times as it gives us more production capacity and flexibility to prioritise urgent jobs. Contaminant free delivery of raw material direct into the extruders - maximum hygiene for your goods. Environmental cost savings as no baling sacks and pallets as with traditional bagged deliveries are used. Working condition improvements for our operators - less manual movement and heavy lifting of polymer, so we can concentrate on extrusion production itself. We run 13 extruders (a combination of British, Italian and Taiwanese made machinery), a number of which have film treaters, in-line printers and double unwinds for sheeting production. All in-house extrusion scrap is recycled using our Erema Reprocessing plant with reprocessed grades stored in internal silos. When compared to other companies, we specialise in short run and narrower width films and as far as possible we ensure that at least 2 extruders have the capability to run every product size. This gives maximum flexibility for production planning in ensuring we can achieve your lead time needs. All our extruders are also linked to sales with a real time scheduling system, so we can give immediate information on lead times and make adjustments where required. Ask our sales team about the system as they love it! After a major investment project with 3 new extruders, recent extrusion investment includes new silos, print units, improved air rings and chillers, a new wide winder plus jumbo take-off units. Film available as Layflat Tubing or Sheeting (Centre Fold, Double Wound, Single Wound and J-Fold). As with extrusion we convert 24 hours a day to maximise flexibility and keep operation costs low. In order to further help ensure quick lead times we also hold particularly large quantities of 'conversion film stock' - various popular widths and thicknesses of film that we can immediately convert into bags on urgent request, rather than have to wait for the film to be extruded first. We are a lean operation and appreciate that this stockholding is rather against some of those lean principles -It''s just that our customers often rely on us to be able to supply bags immediately and we find these stocks invaluable. We run 9 converting machines ( a combination of British, French and American machinery) enabling both bottom-weld and side-weld production of bags and sheets. A number of the machines have accessories such as magic eyes for print register work, perforation and cut out handle devices, plus we have an adhesive glue strip applicator for the production of mailing bags. In the last few years we have had a comprehensive renewal programme replacing older converting machinery with much faster servo-motor driven machines along with powered unwinds to allow the conversion of much larger rolls of film. We have retained a number of the older machines however because despite lower running speeds, they have very fast job changeover capabilities. This makes them still ideal for extremely short run jobs for which we are renowned for being able and willing to do, both quickly and cheaply. Perforations plus print register work are fine, plus bottom weld carrier punch handles. Lips on Side weld bags are fine plus adhesive strip sealing capabilities and side weld carrier punch handles. 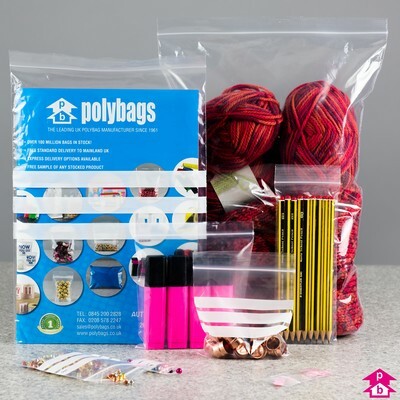 Currently, Polybags send over 100 consignments a day, contrasting in size from a box to many pallets and so we have set up our delivery systems to deal with this wide range. Orders less than a pallet (we term 'box' deliveries although often rolls!) are picked immediately into a cage for maximum protection. This cage is directly loaded onto our hub courier and not emptied until put into another cage for delivery to your local depot. All the delivery drivers are self employed and so ultimately responsible for the condition of their goods delivered. Combining this with our use of high quality boxes and roll wrapping we receive almost no complaints due to damage in transit. Pallet orders are collated, labelled and stretch wrapped in-house before being loaded onto the courier lorry. We restrict pallet height to sensible levels and use various types and sizes of pallet depending on customer needs. Again, we have minimal problems as a result. As a general rule we find customers don't want to have an additional separate delivery charge at the bottom of their invoice so we always quote including delivery to you using our cheap 3 day guaranteed delivery service (We will separate out delivery cost if you prefer). For any urgent orders it is a simple request to upgrade delivery to same day, next day a.m. or a next day service. Any upgrade charges are always passed on at cost only. A number of our larger and merchant customers collect from us -we are conveniently located just off the A40 and only 8 miles from the M25 and this is absolutely fine too. We simply confirm with you when goods are ready for collection. 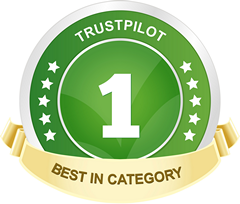 www.targetexpress.co.uk - the UK's largest and most successful independent carrier. www.palletways.com - the UK market leader in the overnight distribution of small consignments of palletised freight.